Courses on OpenLearning are public by default. This means they are searchable and accessible by anyone on OpenLearning. Access restrictions are applied by class. 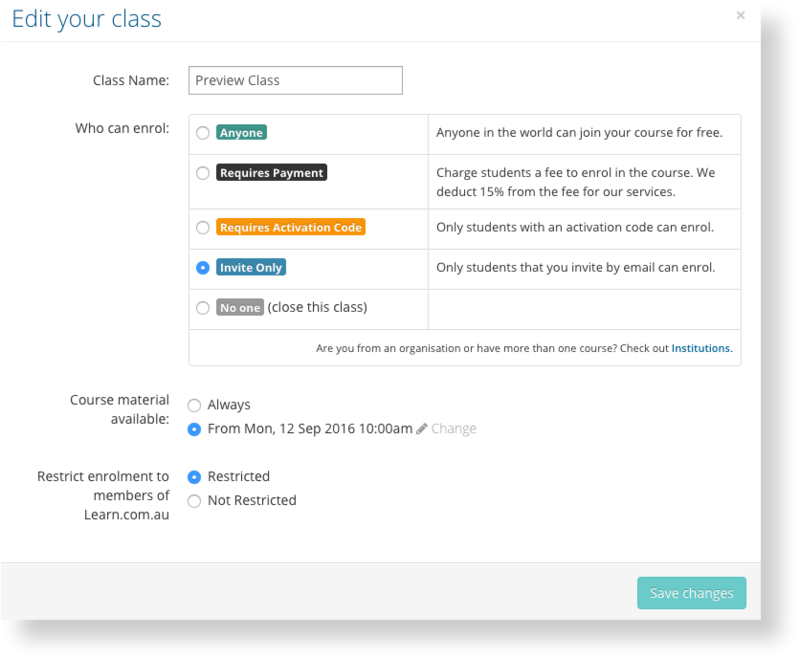 To make a class private, go to the Course Setup > General page and click Change Class under the classes section. You can make your course private by setting the enrolment option to Requires Payment, Requires Activation Code, or Invite Only. Select the appropriate option for your course. If it is a private course does it still have to be submitted to you for approval? Jonathan Kensall Hi Jonathan, all courses (private or not) are automatically checked to prevent the abuse of the platform. You don't need to submit them for that, however, if you want your course listed in our course directory, then it needs to be submitted via the Setup wizard (Step 3) to go through a quality review.